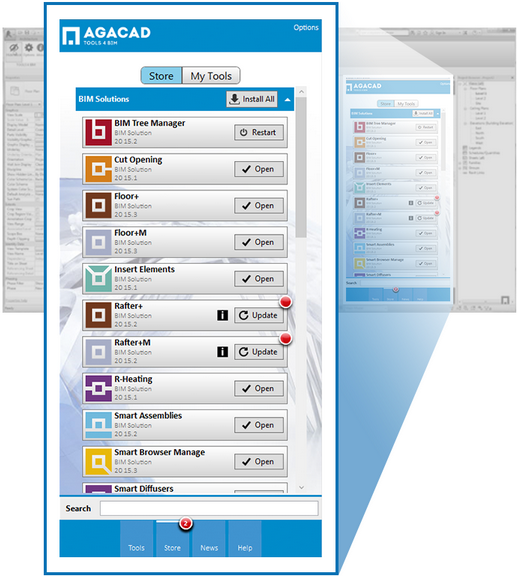 We announce that from now on all AGACAD TOOLS4BIM products support compatibility with both Autodesk® Revit® 2016 as well as the previous Revit 2015. The main novelty of the 2016 version edition – it contains the installer that is a very convenient new platform for tool installation, activation and management named TOOLS4BIM Dock. All AGACAD TOOLS4BIM trials and purchased licenses are acceptable through this platform now. All functionality of our tools will be the same as before except the interface will be different. TOOLS4BIM Dock is a new interactive window in Revit (it works as a separate window just like Project Browser or Properties dialogs) that you can use to access and manage all AGACAD add-ons easily. This tool manager simplifies Revit app installation, activation and usage. Looking for the latest software version compatible with Revit 2016? Download TOOLS4BIM Dock by going to the download page, install all our applications for Revit that you want to try and enjoy using them. TOOLS4BIM Installation and Activation Guide that is placed at Dock Getting Started page will help you to get started quicker. 2016 versions are available free for all active Subscription users. If you still didn’t receive your Activation Code for version 2016 (because of Spam filter or any other reason), please contact us.